Let us introduce you to Mary Morgan, our latest 5 1/2" little girl bear named as part of our Apple Varieties collection. Mary Morgan is made of very short, sparse, tufted lilac South African mohair, with her tummy and ears made of short, silky, pale blue fur, German mohair with a synthetic silk mix which makes the fur lovely and soft. Her pads and paws are pale lilac ultrasuede, she has a blue stitched nose and a blue ribbon flower over her right ear. We have filled Mary Morgan with steel shot and steel balls so she is nice and heavy for her size. She has shiny black German glass eyes and a pale lilac belly button. As you can see, she is a very sweet little bear, I do hope that you like her. 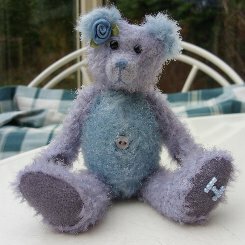 Our little girls have been very popular recently, so if she is the bear for you, don't delay for too long. She costs £40 plus postage. Please note that as with all our bears, Mary Morgan is not a toy and is not suitable for children. Sorry - Mary Morgan has been adopted.